What is Django and what do I need to be able to use it? 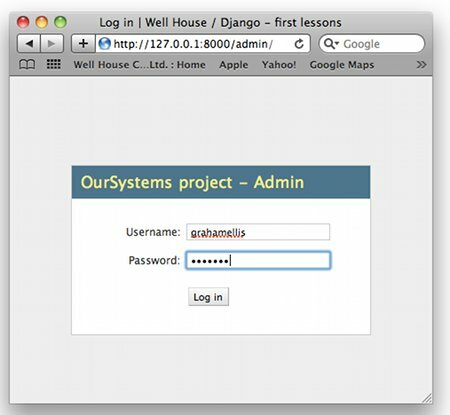 Django is a framework - a tool that lets you create, customise, run and maintain web sites in which the data is stored in database tables. It uses the DRY (Don't Repeat Yourself) philospohy of design - quite the opposite of early web sites, where we saw large amounts of repeated information in page after page, and updating the web site (especially where it was the look and feel or common page furniture that needed changing) was a something of a boring and repetitive task - which was ineffcient and easily lead to inconsistencies. Django is called a framework as it looks after the frame (Citation needed, as they say on Wikipedia ;-) ) and leaves you to concentrate on the content of your site. It's written in Python, and you define your data / look after your application's functionallity using Python too. If you've come across Rails, it's roughly the equivalent for Ruby. Mason works along similar lines for Perl, and CakePHP, Zend, CodeIgniter, Yii and Symfony are among a long list of PHP frameworks. All frameworks (and Django is no exception) have quite a number of component elements to set up ahead of time. This is the downside of DRY - you need to have the structure to manage and maintain your information, and to apply the common look and feel to all your pages, from the single source in which it is held. So there's quite a bit to setting it up. Actually, Django is easier than most, though you may not think so if it's your first ever framework. Yep - that's it! These versions of Python come with the Sqlite database, which will serve excellently for your test database (and in smaller production environments too). 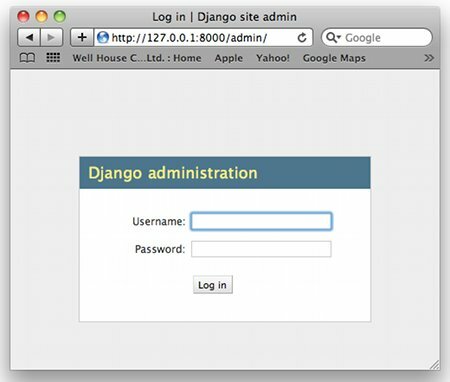 And Django comes with its own test web server, so you can try out your web application without even setting up a server. 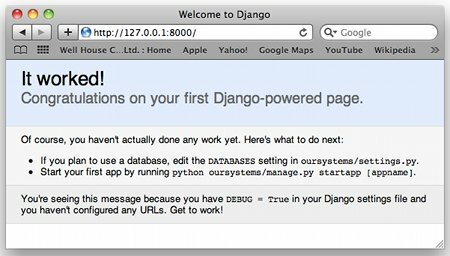 In time, you probably will want to run Django under Apache httpd or a similar server rather that through the test server providesd, and it's quite likely that you'll want to use a database server archirecture such as MySQL, Oracle or PostGreSQL rather that SQLite, and it's straightforward to do so. You can't run Django on Python 3.x (yet!? ); conversion from Python 2 to Python 3 isn't trivial for things like Django (nor for numpy, scipy, ..). You can use Python 2.4, but SQLite isn't built in, so you'll need to have one of the other databases running. How do I download and install Django? Download from http://www.djangoproject.com/download/. I suggest the latest production version - 1.2.4 at the time of thesse notes being written, but should be 1.3 soon. You're not going to be pushing the bounds of the technology as you get to know Django, so don't go for one of the leading edge / bleeding edge releases. Create a directory within your home, move the downloaded file there, and unpack it. For these notes, my computer is called "munchkin", my user name is grahamellis and my home directory is /Users/grahamellis. The computer is running Mac OS X 10.6.4 (Snow Leopard) ... and that's about all you need to know to read the notes. Once that's done, check that it worked - that you can see the django package from python, and that the admin script is avaialble and on your path. What are the elements of Django and an django application? d) Templates for what a fresh project and fresh application look like (terms will be defined in a minute), and also templates for what the pages in standard applications like the admin app will look like. Note - you've unpacked these things. You've not configured, started or run them so far. Now ... looking at the elements we're going to build and run to give us a working website. Some terms. A project is a directory / folder into which we'll place / build our site (or one element on its tree). Within a project, we'll have one or more apps - individual applications, and these applications may be invoked later on through multiple projects. Within an application, we'll have one or more classes which mirror database tables to hold our data. In order to keep the first examples in these notes short, I'm going to write ONE project (called "oursystems") in which I will build ONE application (called "net"). The application is going to be based around ONE table (called "System") and I am going to allow myself three columns of data in that table - they'll be the system's name, the system's IP address, and a piece of text about the system. The data (and its immediate handlers) are known as the model. The way the data is displayed on the screen - the surrounding framework and where bits of data are popped into it - is known as the view. And the elements which transform the data in the model to what appears on the screen are known as the controller. This is really just to re-assure you that the server is there, running, and that it's picked up the empty settings which are complete - it's really your first checkpoint since you started that you've not made any catastrophic errors. If you prefer to view your web pages via a network, you can start the server giving an IP address and a TCP port number - add something like 192.168.200.198:8765 onto the end of the runserver command. The IP address must be (the) one that's serviced by your computer, and the port number you choose should not be in use for anything else. That's a story for me to tell on a networking post, not during a Django one! When you've seen that work, you can kill the test web server - ^C as it says. Your project will want to connect to a database - there is no default, so you should edit the Python source in settings.py. For SQLite, only the Engine and Name need be changed - the Engine setting being specific to the database that we're using and the Name being a complete, absolute path to the file in which the SQLite database will be held. For MySQL, etc, there will be rather more settings like user names and passwords ... and perhaps IP addresses and ports too. Back to that manage script we used before. We have now defined a database connection, but the database file doesn't exist - let alone the default initial takes that Django needs within it. Run the manage script with a syncdb subcommand, and it will create all the files and tables that don't (yet) exist, but leave stuff that's already ben done (none so far) in place. We'll keep coming back to syncdb later on. If you do a directory listing, you'll see that the database file has been created and you'll also see that there are now .pyc files which indicate that python's read and used the settings and url files. You can also check the sqlite tables directly if you've got a command line sqlite utility on your machine (it's not part of the Python or Django libraries - don't worry if you've not got it on your computer). We'll come to views.py and test.py later. Initially (and this is where the coding really starts!) we need to define our database table(s) in models.py. To keep this first Django app truely a "Hello World" one - minimalist - we've just used a single class / table and a single column type in our database - though we have allowed ourselves the luxury of three columns. Looks good ... let's have syncdb do it! Let's add some data - for a first test and check - using the Python interactive console. manage.py can set up most of the environment for you so that all you've got to do is import the model class. That confirms that the table has started empty. Lets add some data (and - note - you MUST commit it to the database with the save method. and copy the standard template for the admin base there. For the moment ... just change some of the basic text, and rerun the admin application to see the effect. We're about halfway through this introduction to Django. We've installed it, set up a project and the model for an simple application within it. We've turned on the admin app to look at (and update) the data via its views. Next steps ... to define our own data views, and controllers to define how the data from the model is viewed. And to add further tables and data column types, joined as appropriate, to the model. UPDATE - next steps added (article no. 2 in this series - views and starting with templates - is [here].